Should it really be India Vs Pakistan? Or should it be India and Pakistan. Have you ever wondered about the similarities we share in culture, habits and food .Then why this bitterness! We are victims of the same issues - terrorism, poverty, corruption. Both the countries got independence at the same time from the British rule. Lots of the issues plaguing these countries are a result of British rule for centuries. In the era of globalization and for the sake of prosperity, eradication of poverty it is important that we forget our differences and work together towards addressing the common issues in society. Taking example from some of the more developed countries we must learn that capitalism is the only way to address issues central to poverty. 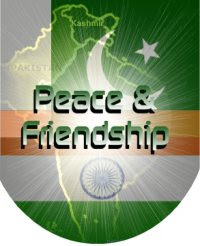 Vast number of resources exist in India and Pakistan, but for so many years they did not trade with each other and preferred to borrow resources at far greater costs from other countries; In the bargain they have stifled growth and so many of its people are locked into the vicious cycle of poverty. Poverty feeds into terrorism and extremism. We must learn together to address the root cause of terrorism. Terrorism in my opinion is the worst case backlash as a result of poverty. Spending in education, poverty alleviation programs and fighting terrorism. We would spend a large percentage of tax payers money to buy arms and build nuclear arsenal.